Marvel Heroes, Gazillion Entertainment’s Diablo-style comioc book MMO, is making the move to consoles as Marvel Heroes Omega. The PlayStation 4 closed beta launched last weekend, and I’m here to show it to you the only way I know how—with copious amounts of Squirrel Girl. Early last year, Gazillion introduced controller support to its long-running Marvel Comics MMO, a move that paved the way for move to consoles, which more and more free-to-play MMO games (Trove, Skyforge) seem to be making these days. Rather than straight porting the PC version, we get Marvel Heroes Omega, essentially the same game with a few console-friendly changes. The game is currently in closed beta on PlayStation 4, accessed by purchasing one of several Founder’s Packs for the game, which start at around $17. Once the game launches, players will be able to try out any hero up to level 10 for free, after which they’ll have to buy the character to progress further. Note that Omega doesn’t seem to be tied to Gazillion player accounts, so PC players moving to console will likely have to re-buy their favorites. Enough talk, here’s some hot Squirrel Girl action. The layout of the game’s prologue mission seems to have changed, though it has been a while since I’ve played through the original version, so it may have changed since. Other than some things I remember in some places being in different ones,the overall experience is the same. Kicking buts and eating nuts came pretty naturally. 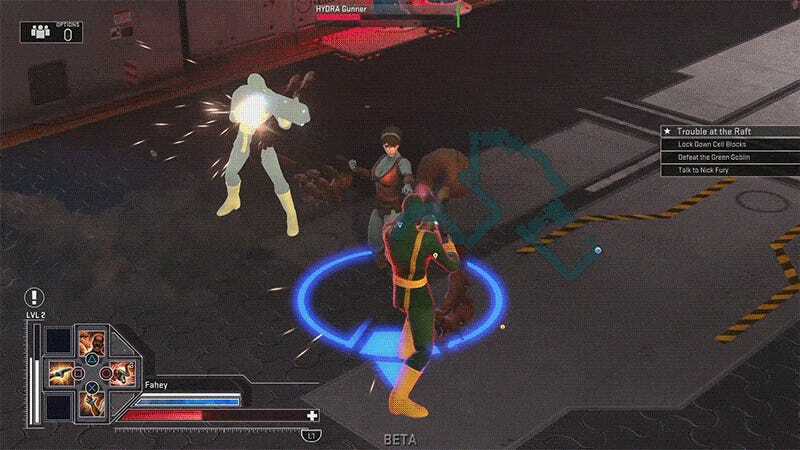 Marvel Heroes Omega is currently in closed beta testing on the PlayStation 4, which is to say it’s in paid beta testing, because come on. The ability to pay and play the game early should be coming to Xbox One later this spring.